Tax and Currency Exchange machine features a solar plus, function command signs and a giant display. 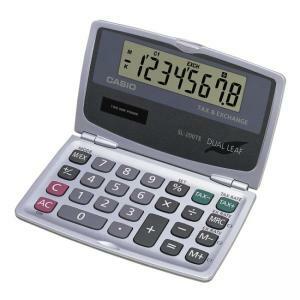 This eight-digit calculator folds to pocket size. A hard-shell, plastic outer case keeps it well-protected. Offers independent memory, case, solar power with battery backup, functional command signs, auto power off and keys for percent, constants and change sign.